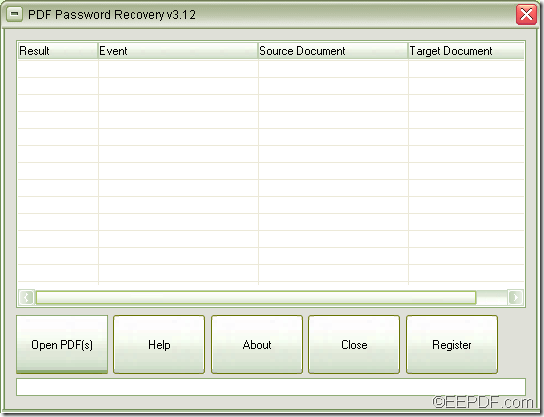 With the help of EEPDF PDF Password Recovery, you cam easily remove PDF owner password in batches. PDF Owner Password is the password used to set document restrictions in PDF files. These document restrictions include printing, changing the document, document assembly, content copying, content copying for accessibility, page extraction, commenting, filling of form fields, signing, and creation of template pages. 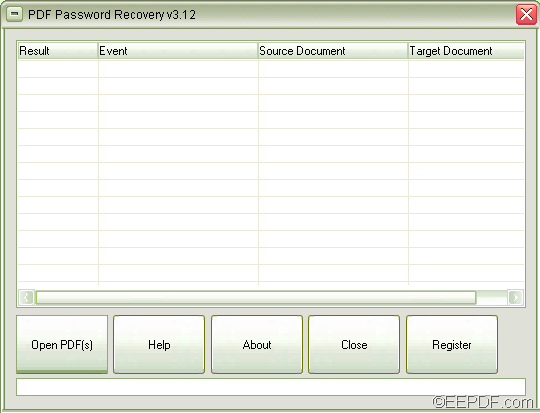 EEPDF PDF Password Recovery is a professional PDF password removal tool. It can remove passwords that prevent PDF from editing, changing, copying, printing, etc., allowing full access to previously restricted PDF files. In the following paragraphs, you will see how to use this tool to remove PDF passwords. 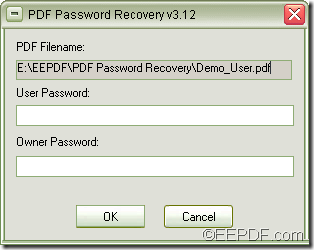 At first, please free download EEPDF PDF Password Recovery and then install it on the computer by following the setup wizard. When you are able to use the application, please launch it. After seeing the application interface like the following snapshot, please click the Open PDF(s) button in the tool bar at bottom of the interface to add the owner password protected PDF documents. To save time, you can also drag the owner password protected PDF files and drop them into the processing table of the application. In the pop-up “Save As” dialog box, please specify a name to save the owner password removed PDF file, and then please click the Save button in the dialog box. Then, the application will instantly remove the owner passwords from the PDF files. When you are trying to remove the owner password from a PDF file that is protected by both owner password and user password, the application will prompt you to input the user password to get access to the PDF file before removing the owner password. Please see it in the next snapshot. Please input the user password in the “User Password” input box and leave the “Owner Password” input box blank. Then, please click the OK button in the dialog box. Then, the application will remove both the owner and user password from the PDF file. 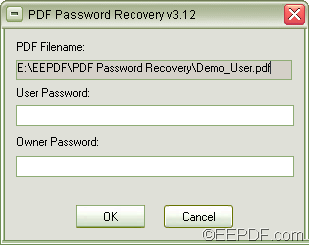 This is the end of this article and you can click the following button to free download EEPDF PDF Password Recovery. This entry was posted in PDF Password Recovery and tagged PDF owner password, remove password. Bookmark the permalink. I have bunch pdf password protected files and i have many time tried to remove password restriction with different types of pdf restriction remover tool but I could not managed complete pdf files. Then i found Kernel for PDF restriction removal software to remove all pdf files password protection without any data loss.